Happy Lammas/Lughnsadah/Calan Awst (“Gathering Day”)! Today is called Lughnasadh, which (by various spellings) is the ancient Gaelic name for the month of August. The first day of August was celebrated as a Gathering Day, the first day in the month when we begin to see the Sun God -Lugh- falter (the days begin to grow shorter). This was the ancient signal that told our ancestors that it was time to harvest the crops and prepare for the coming winter. Because it’s a feast day -what my Welsh ancestors called Gŵyl Awst (the Feast of August) - I get to eat meat and dairy today! That's one of the rules of my flexitarian diet - I'm allowed to break my fasts for special holidays! I’m cooking lasagna and garlic bread because noodles and bread are symbolic of the origins of Lammas Day (“loaf-mas”) celebrating the first harvest of the year – the harvesting of wheat! Blessings to all on this Gathering Day! 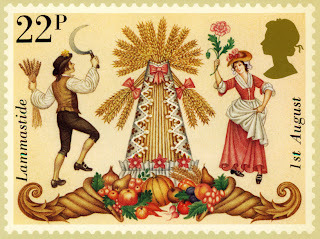 (This image is from an English stamp postcard designed by Fritz Wegner).